I’m very happy, that I finally can publicly announce the project I was working on the last months. I already told you about the OpenStreetMap, this astonishing project with the goal of creating a free map (as in free speech and in free beer) of the world. The great thing about it … you can take the data, use your imagination and think of better ways to visualize the data. 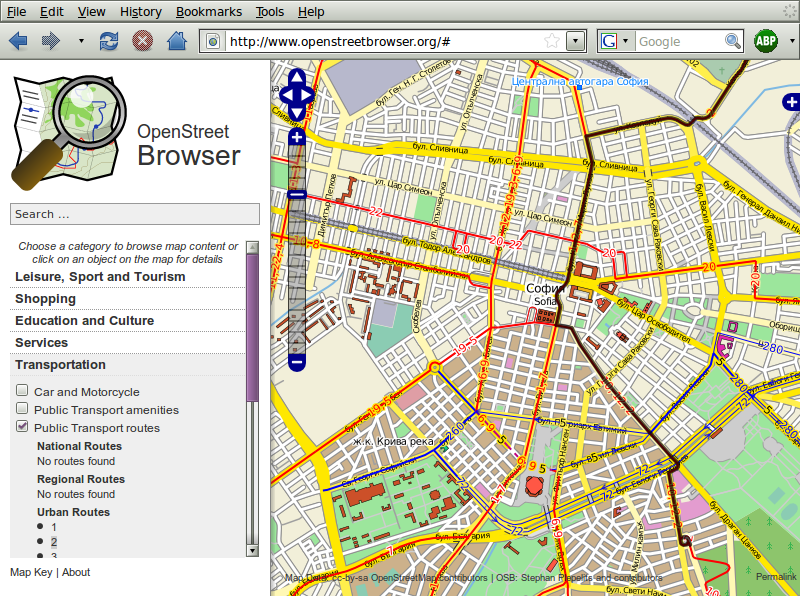 And I used my imagination and creativity and created the OpenStreetBrowser. On the webpage you have a „Slippy Map“, as you know it from the OpenStreetMap Homepage or commercial services like Google Maps. But on the left side you can investigate the current map view. Get a list of Pubs or the Public Transport routes or a list of street names. When appropriate a thematic overlay is displayed. Just play with it, you will see you can’t stop :) If you want to get more information about an object, then just click on it on the map. So. I don’t want to go into more detail here. Just give it a try. If you want more information there’s a page in the OpenStreetMap-Wiki for the project. Disclaimer: The project is not finished yet, it’s still a big construction site. So, please be patient if it gets slow or if you find bugs (please report them here) or something is still missing. As I got stuck in Bulgaria, looking for flat-mates, I continued my work on my OpenStreetMap-Project, I was mentioning earlier on my blog (in fact I was not talking about this project since beginning of November). 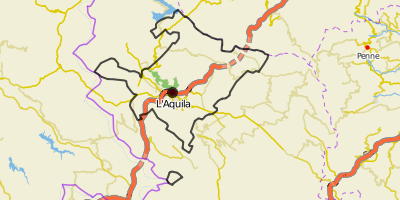 As I already said, the OpenStreetMap is the Wikipedia of geographical data. The data is collected by volunteers or imported from free data sources (e.g. gouvernmental data if available or free satellite images). In Austria a company – plan.at – donated their data, as mapping is not their main business anymore. 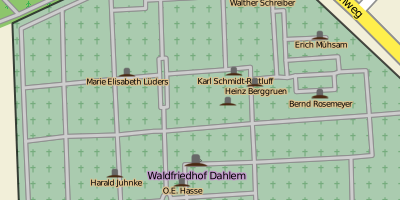 This improved the Austrian part of the OpenStreetMap greatly, especially on the countryside (although the import is not finished yet). My project consists mainly of two parts. 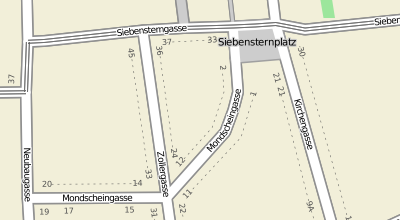 The first – and main part – is an interface to browse the available information in the OpenStreetMap. E.g. if you are looking for a pub or the nearest fuel station. But this is not the part I want to talk about this time. 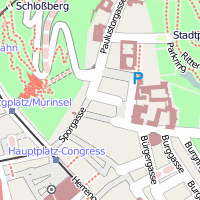 The second part is an improved rendering of the OpenStreetMap. I’m not very satisfied with the default rendering, it looks very pale. I decided to make it more flashy. Additional various overlays can be displayed, e.g. the routes of public transportation (which none of the default renderers of OpenStreetMap do yet). Attention, technical details: I’m using Mapnik as render engine, the same as the default view of the OpenStreetMap uses. To make developing of the new style easier, I’m using Cascadenik, a kind of CSS for Mapnik. 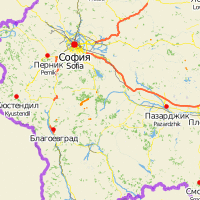 In the first example you can see a part of Bulgaria. 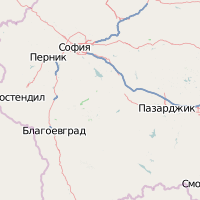 As you can see the country borders are clearer, and the names of the Cities are displayed in the country language and in the English translation (as available). 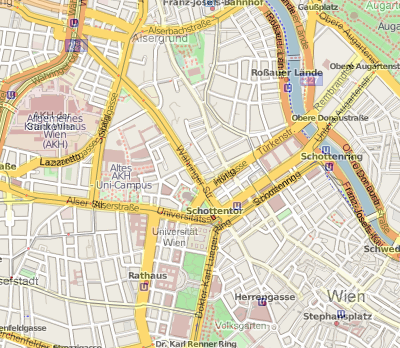 In the second example you can see the surroundings of Schottentor in Vienna. Buildings have different colours, depending on their function and a little border. The last example shows the inner city of Graz with an overlay of the routes of public transportation. I’m busy developing on my application, I hope to be able to show you more of it soon. Also in Burgas the Google Map is way from perfect, even though it is more complete. It looks as if a large part of the town is flooded and the Lake Atanosvko is missing. If you are not satisfied with the OpenStreetMap in your neighbourhood, than become active yourself … The community will be thankful. 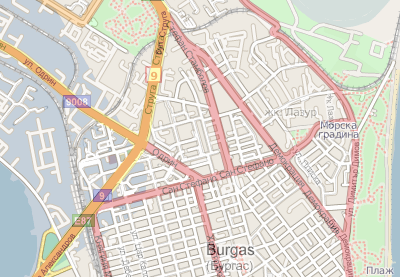 (I got a message this week from an OpenStreet-Mapper from Bulgaria who thanked me for mapping in Burgas). This time I want to tell you something about a project where I’m participating lately. It’s called the OpenStreetMap. The idea behind OpenStreetMap is to build a free map of the world. When Google introduced its Webservice Google Maps and and their software Google Earth everybody was excited what you can do with that. The most important thing: You can share geographic information with others. Like geotagging your pictures on Flickr and displaying them on a map, or describing all your favourite pubs and sites. Now there are several drawbacks with Google Maps (and similar services like MSN Live): It’s copyrighted data, you can’t use it for everything because you have to sign a License Agreement. And you can’t change the data itself. Furthermore, Google Maps is not ideal for me, because it’s optimized for car users. 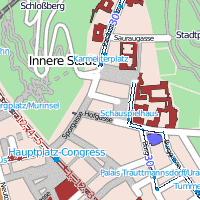 There are even maps for all the underground parkings in Vienna but no Cycle Routes or Public Transport routes. 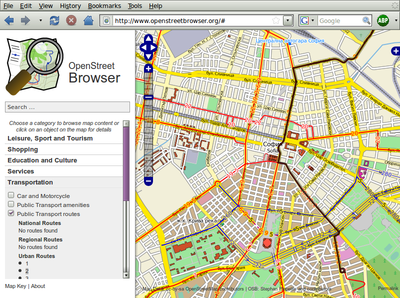 Now, there’s an alternative: The OpenStreetMap (short: OSM), a free editable map of the whole world. The availability of GPS receivers made it possible, because volunteers record their tracks and draw the map by tracing the tracks and adding additional information like street names, road types and amenities (like shops, post offices, pubs, cycle parkings, …). Additional to volunteer work some other information sources has been used, like governmental databases. The result: A yet far from complete but usable map. And it looks nice. And you can access the raw data which is available under a Creative Commons Licence and even allows commercial usage. 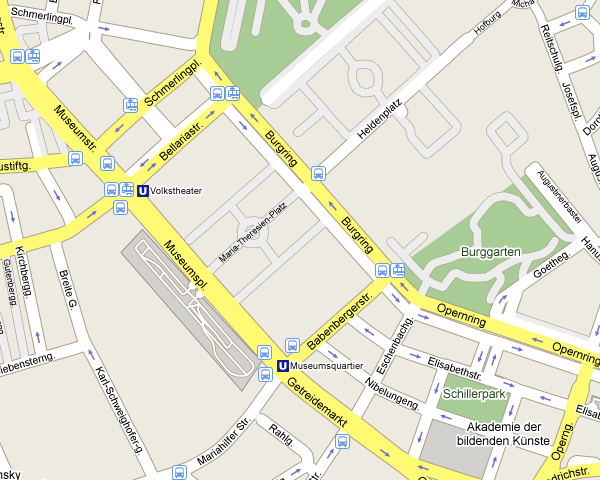 Here’s an example from Vienna’s city centre, you can see the the area around the Imperial Palace and the Museumsquarter. 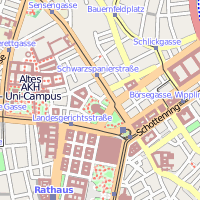 The first picture is taken from Google Maps, the second from MSN Live (how comes the name „2ER Linie“ is used – that’s a commonly used but unofficial name) and the third from the OSM (rendered with the preferred renderer Mapnik). * The Cycle Map: A special view of OSM optimized for cyclists. * OpenPisteMap: A project to track skiing pistes and all things that are important for skiiers like lifts, restaurants, shops and so on. 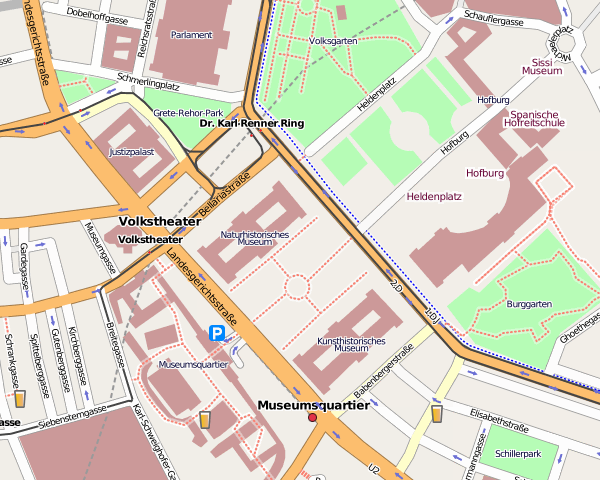 * OpenRouteService: A route planner using OSM data. 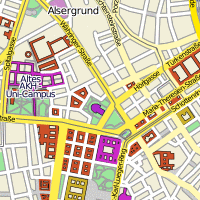 If you want to learn more about OSM than take a look at their Wiki. 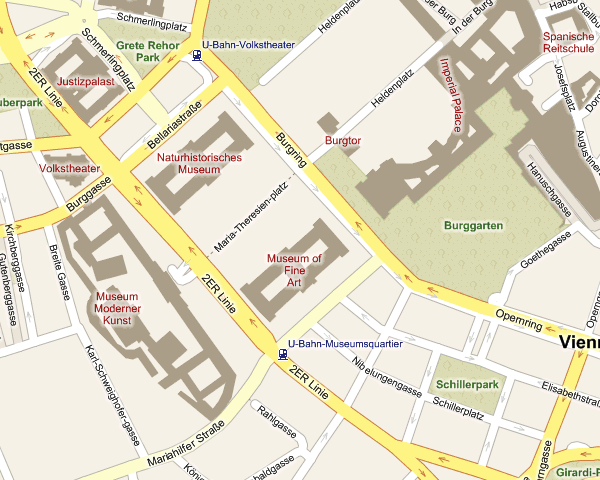 There are some howto’s how to contribute to OSM … you don’t even need a GPS receiver for this.